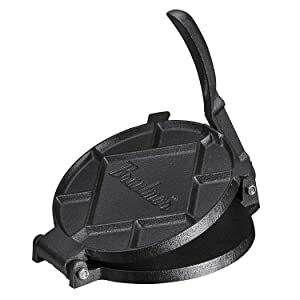 Cast Iron Tortilla Press 7"
There is nothing like the taste of homemade corn tortillas! They taste much better and fresher than store bought tortillas. 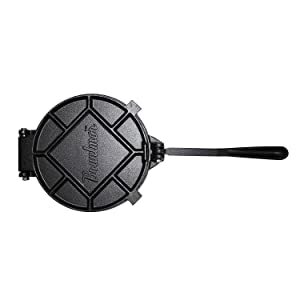 Now, with Bruntmor's cast iron tortilla press, you can make homemade tortillas in no time. Sturdy, durable and has excellent leverage. Great for large quantities! Excellent for tortilla pressing, but also suitable for tostones, empanadas, dumplings, mini pie shells & so much more. 7-inch Tortilla Press is an authentic Spanish food prep device that helps you create delicious Mexican cuisine while giving your modern kitchen a charming heartwarming feel! 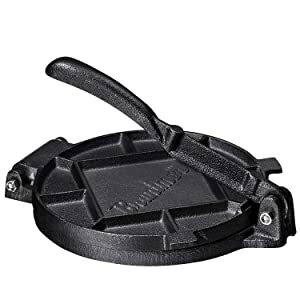 - Heavy-duty cast iron for easy and even pressing. our Tortilla Press makes it easy for users to cook at home with their own ingredients. Excellent for tortilla pressing, but also suitable for tostones, empanadas, dumplings, mini pie shells & so much more. 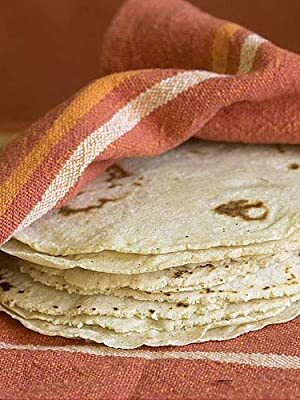 Who Knew Making Tortillas Was So Easy? Total Time Prep/Total Time: 30 min. 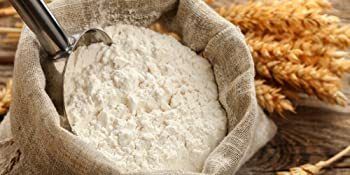 In a large bowl, combine flour and salt. Stir in water and oil. Turn onto a floured surface; knead 10-12 times, adding a little flour or water if needed to achieve a smooth dough. 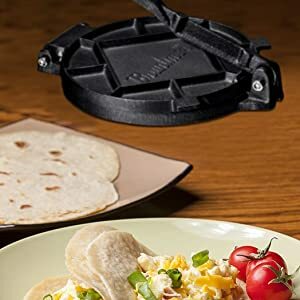 Place in your tortilla press- voilà!